Of the nearly 7.5 billion people on the planet, Only one Nigerian business mogul and Africa’s richest man, Alhaji Aliko Dangote, 61, was named in the list of 75 Most Powerful People in 2018, according to a list released by Forbes. He’s pegged on 66th position coming a spot ahead of Vice President of the United States of America, Mike Pence, who’s pegged on number 67 on the list. 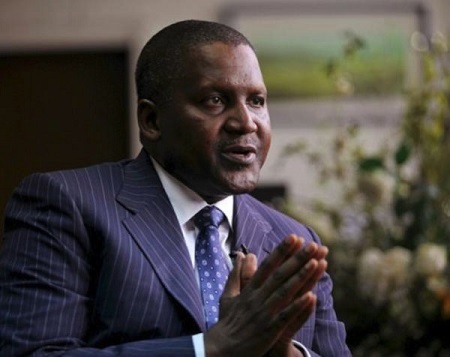 It will be recalled that the President of the Dangote Group of companies has often made such lists due to his business concerns and humanitarian efforts in Nigeria and other parts of the world. Dangote, who made his fortune in the cement industry, is turning his attention to dairy and sugar farming; he’s earmarked $800 million to buy 50,000 cattle in the hope of producing 500 million litres of milk annually by 2019. He’s also racing to finish a 650,000-barrel-a-day oil refinery near Lagos, set to be one of the world’s biggest, and says he intends to spend as much as $50 billion in the next decade on renewable energy and petrochemical refineries, including investments in the U.S. and Europe. Which is all fine, but not quite his grand ambition: buying Arsenal, his favorite soccer team. Xi Jinping, General Secretary of the Communist Party of China, seizes the top spot on Forbes’ 2018 ranking of The World’s 75 Most Powerful People for the first time ever. China’s congress amended its constitution in March, broadening Xi’s influence and eliminating term limits. Russian President Vladimir Putin (No. 2) has been knocked out of the top spot, a title that he held for four consecutive years. A little over one year into his term, President Donald Trump falls to the No. 3 spot. The full list was published by Forbes.